Add contacts and send automatic email invitations. It is quick and easy! Also, you have an overview of who has completely or partially responded to the survey, whose email address bounced, etc. Import an unlimited number of email addresses and validate them instantly upon import. Email addresses that are invalid and bounces are removed automatically. You can choose yourself whether or not to remove email addresses that appear more than once in a list. At the end of the import process you will receive a downloadable report of these errors so that you can update your own contact lists. Each contact has the following fields: email address, last name, first name, language, gender, date of birth, street, house number, apt./suite, city, postal code, province, state, country, phone number and 20 optional fields. 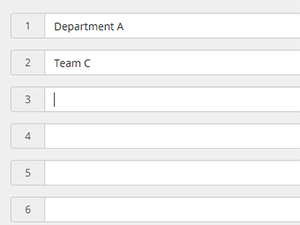 You can use these custom fields to hold important data that you can filter on when forming survey panels or when downloading/analyzing the results. One of the key factors that determine response rate is the quality of the email invitation. Using our rich-text-editor, you control every aspect of the content and formatting. 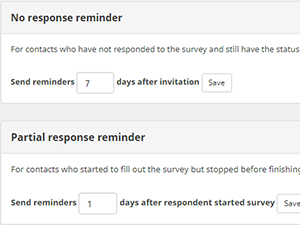 We automatically send individually generated email invitations to each contact after you launch a survey. 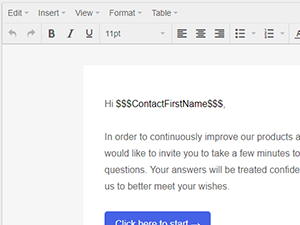 You can place variables in the email that will be replaced by their corresponding values, such as ‘Dear $$$ContactFullName$$$’. What’s more, each invitation contains a unique single-use URL that sends respondents directly to the survey. This increases the ease of use and raises response rate. Respondents can only fill out the survey once. If they cannot complete it at once, they can follow the link again to return to the page they stopped. Another big advantage of using CheckMarket email invitations is that you can embed the first survey question. This makes it really easy for your respondents. They simply click the score they would like to give right in their email client and are then sent straight to the survey, where they will be presented with one or more follow-up questions. After you launch a survey and the email invitations are sent, some of them may bounce. A bounce, or bounce-back, is a returned email that could not be delivered to the addressee for some reason. These bounced emails are automatically registered in your panel. The status of these contacts changes to ‘bounced’. You can try to fix the email addresses or download them to update your own records. This setting allows you to control if and when the CheckMarket email engine automatically sends reminders to your contacts. CheckMarket offers two different reminders. One is for contacts who have not responded to the survey. The other is for respondents who started to fill out the survey but stopped before finishing. This setting can still be changed while the survey is ‘Live’. A contact list is a reusable group of contacts that you can invite to multiple surveys. You can enter contacts manually or upload them from a file. 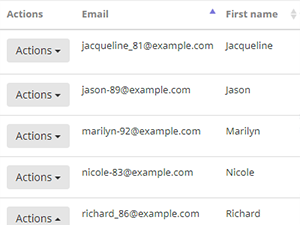 You can use contact lists to easily distribute multiple surveys to the contacts on the list without having to import a file over and over again. 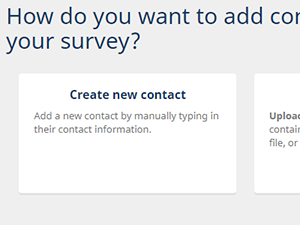 When you add your contacts to a survey, you can sample based on socio-demographic characteristics. For instance, you may wish to add 500 men and 500 women. You can even go further and add age-group or other characteristics from your own data such as client-segment. To ensure that you are not over-inviting contacts, you can also exclude those who were already invited for another survey recently. 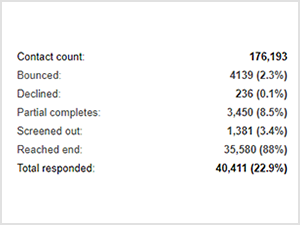 You can view the survey participation history of each contact. In a single glance you see when and in which surveys a person has already participated. By clicking on the report link you can review and compare the contact’s responses from multiple surveys.